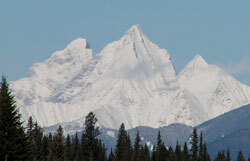 From the summits of hundreds of peaks in the southern Rockies, the giant, twin towers of Mount Goodsir may be seen and easily identified. The northeast faces are great vertical escarpments while the south and west sides are more gentle. They are the highest peaks in Yoho National Park. Located at the southern end of Yoho National Park, the north and south towers of Mount Goodsir are among the highest peaks in the southern Canadian Rockies. The somewhat smaller Sentry Peak rises to the southwest and is part of the group as well. Mountaineer James Outram was a great admirer of Mount Goodsir, writing, "From almost every mountain top...within an immense area of the Rocky Mountains and Selkirk Range, the triple mass of Mount Goodsir is a marked feature of the landscape, towering aloft a thousand feet above the tallest of its immediate neighbours, striking in form and most impressive in its stately grandeur." His attempt to complete the first ascent in 1901 was denied only thirty metres from the summit by a, "razor-sharp ridge that formed the base of a cornice with a fall of several thousand feet on each side." The highest point on the South Tower was ascended in 1903 by Charles Fay and H.C. Parker, guided by Christian Hasler Sr. and Christian Kaufmann. Surprisingly, the only roadside view of Mount Goodsir is a striking but distant view from the Kootenay Parkway in Kootenay National Park. From just south of Kootenay Crossing one can look 44 kilometres up the Kootenay Valley and across Beaverfoot Pass to the towers at the head of Moose Creek. The view is to the northwest and most noticeable while travelling from Radium towards Banff.